Course overview | Participants on this course will make their very own folk flute in African Blackwood. The flute you will make has been specially designed for Cambridge Woodwind Makers by the course tutors Peter Worrell and Paul Windridge. 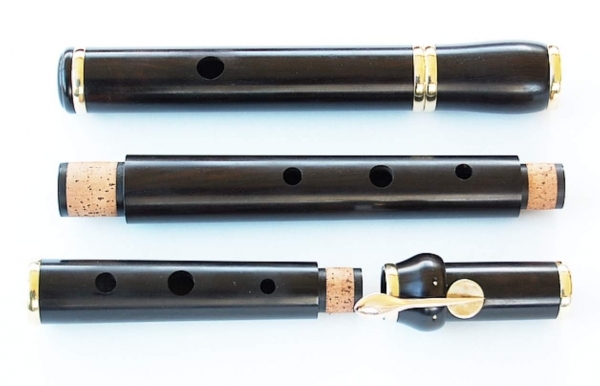 The flute is pitched at 440hz and designed for folk music players; Traditional, Irish and Celtic style music. Over the five days participants will rough billets, bore the joints and do the reaming. Outside turning will be undertaken by a combination of lathe machine turning and hand turning. Participants will set out the toneholes, polish the bores and finishing the outside surface of the wood. They will be expected to hand cut the headjoint embouchure after the initial machining is carried out. 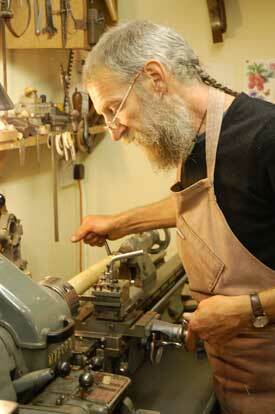 Machine turning of the tenon rings is standard and demonstrations of soldering and banding with silver will be given. The flute has a single key as standard and the student will gain experience of use of hand tools and soldering. Advice will be given on the making of specialised tooling and machinery if students wish to make further models in their own workshops. Courses will only run with a minimum of three participants and a maximum of six. Paul is a woodwind repairer and instrument maker based in Leicestershire. Having worked at Rudall Carte and co in the 1980’s Paul had gone on to be an instrument maker and inventor in his own right. Paul was one of the first craftsmen to see the need and potential of Cambridge Woodwind Makers and provides a huge amount of help and encouragement. 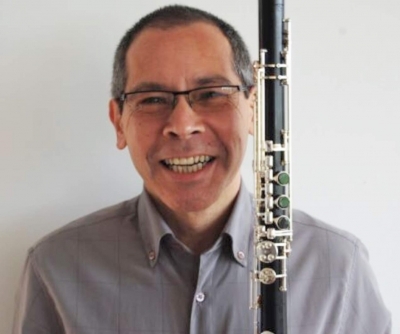 Paul also teaches on the woodwind repair courses held regularly at The Champion Workshop. The course fee covers all the materials, use of tools and expert tuition. It also includes some lunches, light refreshments and some evening meals. The finished flute will be yours to keep. Some wood turning experience is desirable but not essential, however, ideally you would try to gain experience in advance of the course. If you have had prior woodturning experience you are more likely to complete your instrument satisfactorily within the week long course. We can arrange a continuation course if you do not complete within the allocated time.